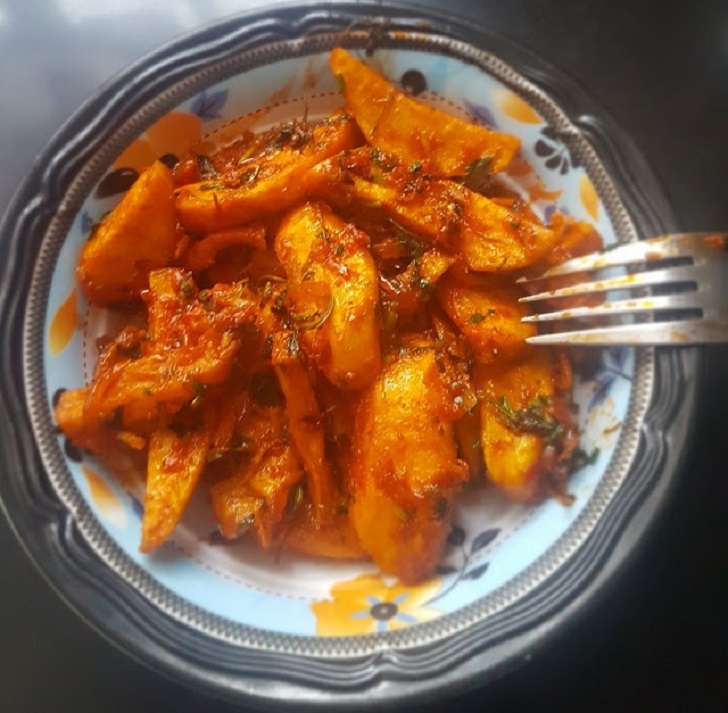 Another way of enjoying this great nutritious potato is by making masala fry. This goes well with rice, chapati etc. The sweetness of sweet potato and the spices added to this makes it a great side dish. This is a simple recipe which can be prepared in under 20 minutes. The great thing about sweet potato masala is, my kids also enjoyed this with rice. You can also try this for your kids as they will enjoy the sweetness of the sweet potato. For the sake of kids, you may add less spices and it tastes great in that way also. Clean the sweet potatoes and boil them in a vessel with water necessary to submerge the potatoes. Add a pinch of salt while boiling this. Allow it to cool and peel the skin of potatoes and cut wedge-like pieces. Crush the cumin seeds and garlic cloves. Keep the pan on the stove and switch it on. Add sunflower oil and then add mustard seeds. When it starts to splutter, add curry leaves, dry red chilies, and cumin seeds. Add urid dhal and allow it to become light brown color. Add onion and the crushed cumin and garlic clove mixture. Add green (or red) chili pieces. Add salt, turmeric powder, and red chili powder. Now add the cut sweet potatoes pieces and mix it properly with the masala. Allow that to cook for 2 to 3 minutes. Mix it well one last time, add coriander leaves and put off the stove. Serve this sweet potato masala with rice or chapati.